In Albany Wednesday, Rep. Dennis Richardson was delayed when his vehicle would not start. Oregon has not elected a Republican governor since Vic Atiyeh won his second term in 1982. 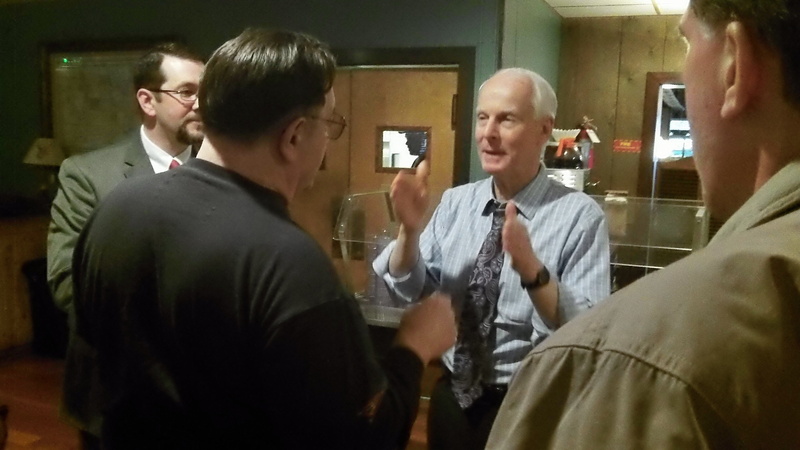 Dennis Richardson hopes to end the GOP drought this year. In Albany Wednesday night, he spoke and answered questions. And from what I heard, I’d say he has a shot. As a state representative from Central Point, he’s served in the legislature since 2003. In his one term as co-chairman of the budget-writing Ways and Means Committee, he made sure the state had not just the required balanced budget but a reserve fund for schools for the second year of the biennium in case things went south, and without an increase in taxes. Richardson talks with Albany Councilman Rich Kellum and Linn GOP Chairman Michael Wynhausen, left. His monthly newsletters — not the usual collection of old news and self-promotion that many legislators issue — were packed with information. As an editorial writer I found them useful as guides through tax and budget issues. One problem has long been that state government wants to outgrow its revenues. When he had the chance as budget co-chair, Richardson proved that, as he said Wednesday, you have to be “strong enough not to fund everything.” That’s why the public employee unions will do everything to keep him out of the governor’s office. On the still-not-fully-functioning health insurance exchange and subjects such as energy policy and forest management, the dominant view during the nearly 20 years of the Kitzhaber-Kulongoski-Kitzhaber administration is that the policy makers and their consultants know best and the people should just put up with things like declining resource industries and higher prices for heat and light. “We need to replace this elitist attitude,” Richardson says. He also pledges that he would be a governor who gets things done. Like what? How about a freeway cutting across the state from Ontario to Coos Bay? Making big use of the deep-water port could be a big step in lifting the South Coast counties out of their long depression. Richardson knows that to win, he needs lots of votes in Multnomah, Clackamas and Washington counties. Strong support in rural Oregon alone won’t cut it. That’s why in June he and his wife plan to move to Multnomah County. I think I would vote for this man.. I was very impressed with what Dennis had to say on a wide range of issues. He answered questions straightforwardly–everything without notes. His legislative experience in Oregon is impressive–he is a fiscal conservative in his private life and knows gov’t likes to easily spend other peoples money and wants to stop that practice. His website is http://dennisrichardson.com. He needs contributions to help his election succeed. 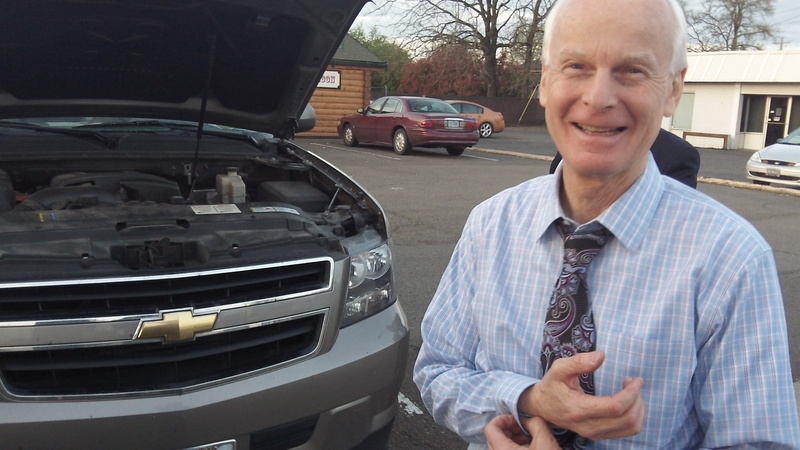 His PAC is “Dennis Richardson for Governor,” 89358 Cranberry Lane, Bandon, OR 97411. I liked Dennis too. He knew the issues and had some great ideas on how to tackle them. I especially liked how he steadfastly stuck with things – adjusting when needed – until ultimately succceeding or being wise enough to toss the idea aside. Had our current Governor listened to Dennis’ repeated warnings about the Cover Oregon web site, it quite possibly would not be the mess and embarrasment it is today. He sounds like a real breath of fresh air for my beloved state.